Welding of ASTM A-515Gr-55 and ASTM 516Gr.55 pressure vessel steels subjected to intermediate and lower temp applications. Used for welding 1% nickel steels, high tensile alloy steels, boilers, pressure vessels, pipe lines and storage tanks. Welding high tensile steels. 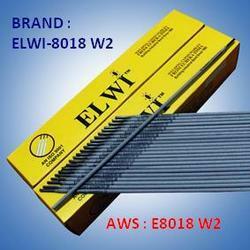 Specially recommended for weathering steels like CORTEN A and B and their equivalents. Used for materials with a minimum tensile strength requirement of 62Kg/mm2 i.e AISI 4130, ASTL A487 grades 2A, B & C(Cast). Machinery parts of high tensile steel, parts of earthmoving equipment. Repairs of case-harding steel parts after removing the hard zone.